"Who knew dessert could be this easy? Or healthy? This sinless sweet potato will delight you no end." Place the mashed sweet potato in a microwave-proof dish. Mix in the cinnamon and pecans, if desired. Drizzle with honey. Place in microwave and heat until warm. Serve immediately. 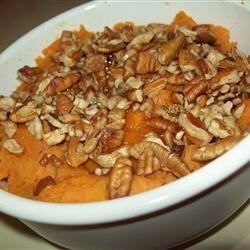 This is very flavorful if you like yams! Also yummy is to serve it drizzled with fresh orange juice. Enjoy! I did not like this recipe it was not like a treat it was more heslthy snd the yams were strong.